iram SCRIPTURE (1772-1849) and Elizabeth PARKER (1771-1862) were my fourth great grandparents. They were married in Connecticut and settled in Oneida County, New York. To this marriage arrived several children, one of whom was Hiram SCRIPTURE (1807-1851), my third great grand uncle. (See my previous blog post for more information about Hiram’s family (http://www.theartofgenealogy.com/2013/04/michigan-biographical-index-langdon.html). (1) As noted above, I thought that Margaret’s maiden name was Speer or something similar to that. (2) Why did Hiram and Margaret get married in Barre, New York, which is in Orleans County? Most of my ancestors lived around Oneida, Chenango and Madison Counties. If Margaret was from Barre, how did Hiram meet her? Did he live there too sometime between living in Oneida County, New York, and moving to Michigan? Did they marry in Barre for some other reason? (3) Was Margaret Parker related to Hiram’s mother’s Parker line, i.e., did Hiram marry a distant cousin? Hiram Scripture is a fairly uncommon name, and the notice was correct about Oneida County, New York. It was also correct about Michigan. The year 1835 would be a reasonable time for Hiram to marry—he was born in 1807. My records show that Margaret was born about 1815. So, based on the apparent accuracy of the article, I am inclined to believe that Margaret’s maiden name was indeed Parker. Still, since this was a secondary source, I needed to back it up with some more evidence. Sophronia Spear died on 26 Jul 1870 in Washtenaw, Michigan (6), and is buried in York Cemetery in Milan, Washtenaw County, Michigan (7), the same cemetery where Hiram Scripture is buried. (8) What is perplexing is why there is no reference to the name Parker. Perhaps Sophrunia Spear never married Mr. Parker. It is excellent practice to order microfilms from familysearch.org. Women can be tricky to research because of their many name changes. Keep an open mind as to locations when searching for your ancestors. They may appear in unusual places. There are many conflicting sources for genealogical information. You have to cast a wide net and examine and compare each piece of information. See if I can find out why the marriage of Hiram and Margaret was in Barre, Orleans, New York. Try to discover Margaret Parker’s connection, if any, to the family of Elizabeth Parker, Hiram’s mother. Visit the York Cemetery in Milan, Washtenaw County, Michigan, to see if I can gather any additional information and to get photographs of the gravestones of Hiram Scripture and Sophrunia/Sophronia Spear. Attempt to locate a reference to a marriage between Sophrunia/Sophronia Spear and a man with the surname Parker. Dover Publications, Inc. Mineola, New York, Electronic Clip Art, Elegant Floral Designs, 2003. (1) "Michigan, Marriages, 1822-1995," index, FamilySearch (https://familysearch.org/pal:/MM9.1.1/FCDM-NZW : accessed 30 Jun 2013), Langdon W. Scripture and Louisa E. Conrad, 04 Apr 1894. (3) Find A Grave, Inc. Find A Grave, digital image (http://www.findagrave.com: accessed June 30, 2013), Margaret Rosebrook (1814-1900), Elmwood Township Cemetery, Tuscola County, Michigan, Memorial No. 28095871, created by Papaduck34. 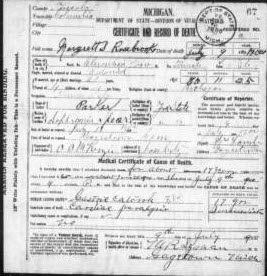 (4) Michigan Department of State, death certificate no. 67 (1900), Tuscola County, Margaret S. Rosebrook [indexed as Margrett]; digital image, State of Michigan, Seeking Michigan (http://www.seekingmichigan.org: accessed June 29, 2013). (6) Genealogical Death Indexing System, Michigan Department of Community Health, entry for Sophronia Spear (www.mdch.state.mi.us: accessed June 30, 2013). (7) Find A Grave, Inc., Find A Grave, digital image (http://www.findagrave.com: accessed June 30, 2013), Sophrunia Spear (unknown - Jul. 28), York Cemetery, Milan, Washtenaw County, Michigan, Memorial No. 25699441, created by Angela Peters. (8) Find A Grave, Inc., Find A Grave, digital image (http://www.findagrave.com: accessed June 30, 2013), Hiram Scripture (unknown - Jul. 27, 1851), York Cemetery, Milian, Washtenaw County, Michigan, Memorial No. 71379605, created by Leta Knauss.